Wine Review: 2007 Louis Martini Sonoma County Cabernet Sauvignon | Wine Splash! Many people we know have been raving about this wine and we finally gave in and bought a bottle. We bought it on sale for $14 so it definitely is a good value for a 2007 Sonoma County Cabernet. On sight, this wine is a very nice garnet color with ruby hues on the edges. On the nose, there were aroma’s of dark berry, plum, and vanilla spice. We seemed to get a sense of high alcohol and saw that it was at 13.9% which is just right for a big Cabernet. Over the palate, the wine was full bodied, smooth, with a firm tannin structure. Flavors of ripe blackberry, loganberry, and toasty oak excited our palate! It was very fruit forward but had a nice balance of herb and spice on the long finish. As the wine opened up further, hints of olive oil and tobacco came through on the finish as well. We had this wine with a nice grilled steak and it was a wonderful combo! We would also pair it with most red meats, pasta with a tomato sauce, medium to sharp cheeses, or a Grilled Eggplant Parmesan. 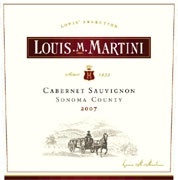 We guess our friends were right and we did enjoy the 2007 Louis Martini Sonoma County Cabernet Sauvignon. We give this wine an 88 point rating and felt it is a wine that compliments good food. It is a very tasty and straight forward Cabernet that doesn’t try to be different. All the correct flavors are here for you to enjoy. If you have a 2007 vintage, we would drink it before 2014. WineSplashing! !